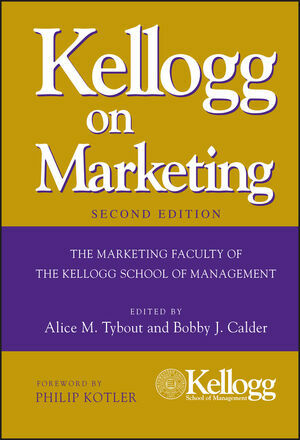 The second edition of Kellogg on Marketing provides a unique and highly regarded perspective on both the basics of marketing and on new issues that are challenging businesses today. Along with the new material, the core concepts covered in the first edition have all been updated-including targeting and positioning, segmentation, consumer insights, and more. This is a must-have marketing reference. Alice M. Tybout is the Harold T. Martin Professor of Marketing and a former chairperson of the Marketing Department at the Kellogg School of Management, Northwestern University. She is academic director of the consumer marketing strategy program and the branding program at Kellogg's Allen Center, the author of more than forty articles and book chapters, a consultant for leading companies, including Abbott Laboratories, Coca-Cola Company, and Pfizer, and a member of the board of directors of RHR International. Bobby J. Calder is the Charles H. Kellstadt Professor of Marketing and the current chairperson of the Department of Marketing at the Kellogg School of Management, Northwestern University. Previously, he has taught at the Wharton School, University of Pennsylvania, and has been a consultant for Booz Allen Hamilton. He is the author of numerous research studies and articles. He has been a consultant to companies such as Aetna, Bristol-Myers Squibb, Cemex, Coca-Cola, General Electric, General Motors, McDonald's, Motorola, Prudential, Tribune Co., and Time Warner.